This is a great signal for SaaS sales teams that want to identify the accounts that are most likely to convert, but it is also very helpful for marketing and product teams. Marketing: Relevant, qualified and nurtured new trials are more likely to be engaged once they begin their trial. Product: A better, clearer and smoother first user experience, increases the amount of trial accounts that actually go through the evaluation. The question so far has been how to systematically measure the ratio of engaged trials with your offering? A month by month analysis of the percentage of trial accounts that are engaged in their evaluation. 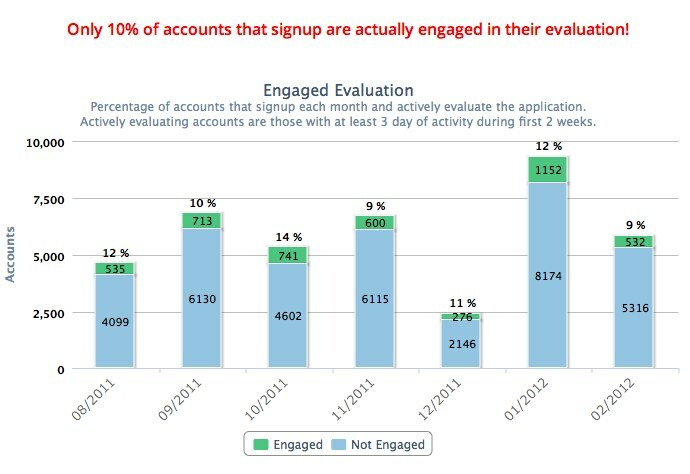 Engaged accounts are those that have at least 3 days of active usage during their first two weeks of trial. What you can learn from this report? The percentage of engaged evaluations is simultaneously an indicator of the quality of the incoming leads and of the first-user-experience your application delivers. For an established business, you should expect at least 20% engaged evaluation, ideally reaching 50% or more. Monitor this metric on a month by month basis and take actions in marketing, sales or product onboarding to maintain a high ratio of engaged evaluations. To assess leads, you can also break down this information by Source Campaign, in order to identify which marketing campaign are generating the most engaged leads. – Not a Totango customer yet? : Signup for a free trial or contact us to talk.